Discussion in 'Plugins' started by storm shadow, Aug 4, 2016. Keypatch is a IDA Pro plugin for Keystone Assembler Engine. Keypatch consists of 2 tools inside. Patcher: this allows you to type in assembly to directly patch your binary. Keypatch is confirmed to work on IDA Pro version 6.4, 6.8 & 6.9, but should work flawlessly on older versions. If you find any issues, please report. Sometimes we want to patch the binary while analyzing it in IDA, but unfortunately the built-in asssembler of IDA Pro is not adequate. Only X86 assembler is available. Support for all other architectures is totally missing. The X86 assembler is not in a good shape, either: it cannot understand many modern Intel instructions. Keypatch was developed to solve this problem. Thanks to the power of Keystone, our plugin offers some nice features. Keypatch can be the missing piece in your toolset of reverse engineering. Install Keystone core & Python binding for Python 2.7 from keystone-engine.org/download. Or follow the steps in theappendix section. Copy file keypatch.py to IDA Plugin folder, then restart IDA Pro to use Keypatch. On other *nix platforms, the above error message means you do not have 32-bit Keystone installed yet. See appendix section below for more instructions to fix this. 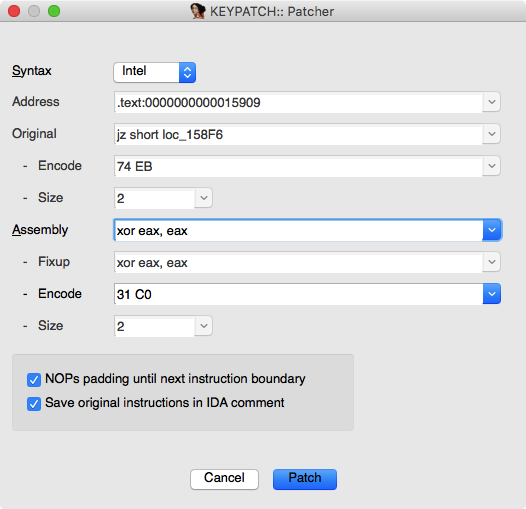 To patch your binary, press hotkey CTRL+ALT+K inside IDA to open Keypatch Patcher dialog. The original assembly, encode & instruction size will be displayed in 3 controls at the top part of the form. Choose the syntax, type new assembly instruction in the Assembly box (you can use IDA symbols). Keypatch would automatically update the encoding in the Encode box while you are typing, without waiting forENTER keystroke. Note that you can type IDA symbols, and the raw assembly will be displayed in the Fixup control. Press ENTER or click Patch to overwrite the current instruction with the new code, then automatically advance to the the next instruction. Note that when the new code is shorter than the original code, the extra bytes will be filled in with NOPs by default. Uncheck the choice Padding extra bytes with NOPs if this is not desired. By default, the modification you made is only recorded in the IDA database. To apply these changes to the original binary (thus overwrite it), choose menu Edit | Patch program | Apply patches to input file. To do some code assembling (without overwritting binary), open Keypatch Assembler from menu Edit | Keypatch | Assembler. Choose the architecture, address, endian mode & syntax, then type assembly instruction in the Assembly box. Email keystone.engine@gmail.com for any questions. For future update of Keypatch, follow our Twitter @keystone_engine for announcement. IDA Pro's Python is 32-bit itself, so it can only loads 32-bit libraries. For this reason, we have to build & install Keystone 32-bit. This section details the steps towards that goal. It is easiest to just download & install Python 2.7 module for Windows from http://www.keystone-engine.org/download. Be sure to get the 32-bit version, regardless of your Windows edition. If you prefer to compile from source, just use MSVC 32-bit & follow the instructions in Windows documentation to buildkeystone.dll. After that, install Python module as in Python documentation. Then copy keystone.dll to the directory of Keystone Python module. Since version 0.9.1, by default Keystone is built in universal format, so you just need to follow the instruction in Unix documentation to compile & install it. After that, install Python module as in Python documentation. In short, you can simply run the following commands in the source directory of Keystone to do all the above. If your system is Linux 32-bit, you can do the same steps as in MacOS above. In case you are on 64-bit Linux, you need to cross compile Keystone to 32-bit. Since version 0.9.1, Keystone supports lib32option to make this easy. After building the core, install Python module as in Python documentation. After having multilib dependencies, run the following commands in the source directory of Keystone. Finally, copy the 32-bit binaries at build/llvm/lib/libkeystone.so. * to the Python directory of IDA Pro, for example at/opt/IDAPro6.4/python/. Done? Now go back to section 2 & install Keypatch for IDA Pro. Enjoy! roocoon, m4n0w4r, computerline and 1 other person like this. This new version of Keypatch brings some important features, as follows. it could be that you have to use the Python-keystone x64 bit one, remember that ida 7.0 + is only 64 bit, even the x32 ida version. Also that said, you wouldent need the python 2.7 x86 anymore. Also tested it with 7.0 + and the code in the plugin is not compatible with 7.0, even when it says in the readme. m4n0w4r and samoray like this. For it to work , we would need to write ida menu action handlers. 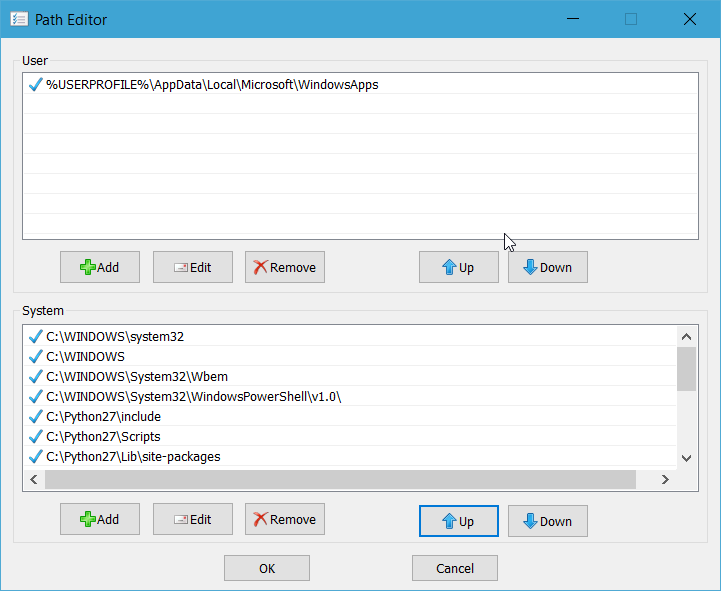 then save raw code as /idafolder/plugins/keypatch.py and use the x64 version of keypatch all is working. Ok, for now I deleted all links for the Python 32bit version in system PATH, that should get it away . is this a problem with hot key setting or what? You can use both python 32-bit (for IDA 6.8) and python 64-bit (for IDA 7.0). After that, if you want to use IDA 7.0, must run the .bat file first and then ida.exe / ida64.exe .. All from command line!! Thank you for the tip. that works perfectly. saving the raw code to keypatch.py in IDA plugins folder did the job . but how does the already compiled one did not work. I dont understand? ?